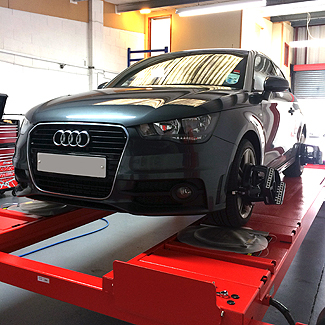 As well as wheel alignments, ATEC-ALIGN offers other types of work, including alignment adjustments using owner’s modified settings, servicing, suspension, brakes and exhausts. Having your vehicle aligned by ATEC-ALIGN’s specialist will help to improve tyre life, maximise fuel efficiency and improve your driving comfort and safety. ATEC-ALIGN carries out a comprehensive alignment analysis of your vehicle, explaining the results before and after any required adjustments. ATEC-ALIGN is equipped with the award-winning Hunter Hawkeye Elite TD alignment system. Using real-time imaging cameras, we measure all 14 primary angles on your car and automatically compare these against the latest technical specifications available from your vehicle manufacturer. We then provide you with a colour, easy to understand printout to prove and explain any alignment difficulties we may find. If any work is required, we’ll discuss this with you before any work is carried out. When all the required adjustments have been made, we’ll provide you with a second alignment printout which can be stored with your usual service documents.